Spring is a popular lightweight dependency injection and aspect oriented development container and framework for Java. It reduces the overall complexity of J2EE development and provides high cohesion and loose coupling. Because of the benefits Spring provides, it is used by a lot of developers for creating high traffic small to enterprise level applications. But, these high traffic Spring applications face a major scalability proble m. Although these applications can scale by adding more servers to the application server farm, their database server cannot scale in the same fashion to handle the growing transaction load. In such situations, a Java distributed cache is your best bet to handle the database scalability problem. It offloads your database by reducing those expensive database trips that are causing scalability bottlenecks. And, it also improves your application performance by serving data from in-memory cache store instead of the database. 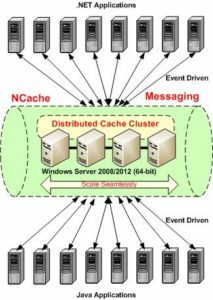 NCache is a Java distributed cache and has implemented the Spring cache provider. It introduces a generic Java cache mechanism with which you can easily cache the output of your CPU intensive, time consuming, and database bound methods of Spring application. This approach not only reduces the database load but also reduces the number of method executions and improves application performance. NCache has a set of annotations including @Cacheable to handle cache related tasks. Using these annotations you can easily mark the method required to be cached along with cache expiration, key generation and other strategies. When a Spring method marked as @Cacheable is invoked, NCache checks the cache storage to verify whether the method has already been executed with the given set of parameters or not. If it has, then the results are returned from the cache. Otherwise, method is executed and its results are also cached. That is how, expensive CPU, I/O and database bound methods are executed only once and their results are reused without actually executing the method. Java distributed cache is essentially an in-memory key-value store, therefore each method innovation should translate to a suitable unique key for the access. To generate these cache keys NCache Spring distributed cache provider uses the combination of class name, method and arguments. However, you can also implement your custom NCache Spring key generator by using com.alachisoft.ncache.annotations.key.CacheKeyGenerator interface. Hence, by using NCache as a Spring cache provider you can scale Spring applications linearly and boost performance. This entry was posted in 3rd Party Integrations, Caching in Java, Distributed Cache and tagged Distributed Cache, Spring. Bookmark the permalink.